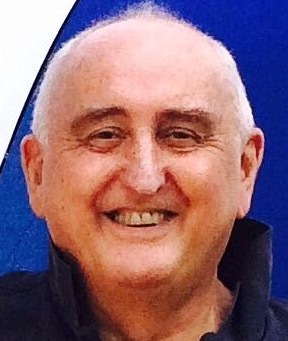 On the 23 October, three and a half weeks ago, my darling husband died. He fought hard at the end, before finally drifting into a deep peace. He died with his brother, his son and me holding him. As his brother spoke the words commending Alan's soul into the hands of God, Alan died gently and silently. Mr B. Wonderful, stubborn and loved. One morning, Alan's pain and discomfort was too great for him to convince himself it could be managed at home. He spoke on the phone to his hospice nurse, who sent the hospice doctor to our house. The hospice doctor asked to use the phone and after a while, managed to arrange a bed at the hospice where Alan had long been a trustee and had been instrumental in its set up many years ago. Alan had very much wanted to go to that hospice, if he had to go to one at all, and he was relieved. Later that afternoon as Alan walked slowly to the car, he told me that he feared he would not see his home again. I told him that he was going for respite, of course he will be back. He was dead within the week. Sleeping peacefully at home while I sit on the sofa, reading or watching telly. Before we packed his bags for the hospice, the post arrived and in amongst the envelopes was a small Amazon delivery. My engagement ring had arrived. I made him sit up, open the parcel, and put it on my finger. We laughed, it was absurd. We had married in a hurry on the 22 August when he was so ill in hospital, and when eventually he was allowed home, he set about selecting the engagement ring. Back to front, he said, it was all back to front. But I needed a ring, he said, and so we looked on Amazon, selected one, and sent off for it. The last day that he spent in this house was the day that it arrived, and I take great comfort that I didn't open the parcel on my own later and put it on my own hand. Thank goodness, I say to myself, he put my engagement ring on before he left for ever. The care at the hospice was more than we in our daily lives can imagine. Perhaps this is what true goodness is. To take seriously someone's suffering, to keep watch for all those who are with the person who is ill, and to show foresight, compassion, tenderness and strength to all. 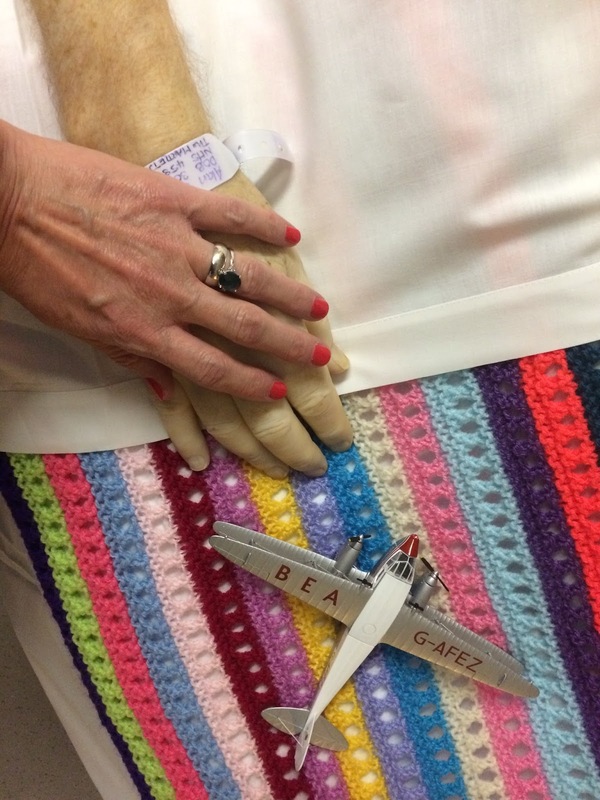 The nurses, the consultants and the doctors, the volunteers, the housekeeping staff, hold the hospice together as a place where dying is given honour and space. Alan's condition deteriorated after his admission, his medication having to be constantly reviewed to give him peace, relief and comfort. When the pain broke through which it did often, it was quickly and efficiently dealt with. It gave Alan huge reassurance and relief, and it enabled us, his family and friends to be just that, family and friends, and to spend quality time with him. We could focus on loving him, and being there for each other, knowing that Alan's pain was under control. A few hours before he died, as he lay unconscious, his breath rattling and his face pale, two nurses raised his bed, and quietly stripped his crumpled sheets and pyjamas, washed him gently, shaved him beautifully and brushed his hair. They remade his bed with crisp, fresh sheets, put clean pyjamas on him and placed the most beautiful brightly multi coloured knitted blanket over his sheet. I watched them from the spare bed in the corner, where I and Alan's son, would stay. Here is great care, I thought. Here is care from the heart, care that cannot be thanked, here are two ladies who do this day and night for people, gently, kindly, taking the initiative because it is the right thing to do. And that blanket - Alan would love that blanket. He would smile because he would know I would love that blanket! And so, later that night, at 10.15, we three sat together holding him as he quietly, with very little warning, ceased to breathe just as Alan's brother was praying for the commendation of his soul. His son and I were watching him, holding his hands, and all of us loving him in our hearts. When it was over, when the nurses told us to take our time with him before we washed and laid him out, I saw that there were no flowers in the room. I took the two little model aeroplanes he'd brought in with him and put them on his pillow instead. There, I thought, they will fly you away up into the sky now to your next life. Alan's son and his brother left the hospice some hours later and I did not. I was not able to leave Alan and felt that if I did go, he would know and feel afraid. I stayed, talking to him and crying a little, packing my bags, sitting down and holding his hand, and then continuing to pack my bags until well into the early hours. I had changed into my own pyjamas earlier in the evening, and could almost imagine that we were both just getting ready for bed, not that he had just died and I was packing up my things to leave him for ever. He looked fine, he looked well, just very, very still. He was no longer breathing those little breaths, there was no tension in his face, and he looked beautiful. Clean shaven, hair brushed, just as he would have wanted to look with his favourite maroon coloured polo shirt, and that bright, happy, colourful blanket. And his two little aeroplanes, those two little planes he loved that reminded him of flying with his father when he was a boy, on each side of his pillow. Very masculine, I said to him, very manly. I wondered if he was still hovering somewhere in the ether and could hear me, but I didn't feel anything. Just my own sadness and a reluctance to go home. Holding Alan's hand, one of the aeroplanes, the colourful blanket and, my engagement ring. Let us know when you go, a nurse had said, come and find us. Don't leave without telling us. It was raining heavily outside. Pulling my suitcase behind me on its little wheels along the silent dimly lit hospice corridors, I found the nurses and told them that I was leaving. It was 3am. In my dressing gown, pyjamas and slippers, pulling my suitcase, I walked into the storm outside followed by a kind and experienced nurse, making sure I reached the right car and was fit to drive. It felt very Shakespearean with the wind and rain manifesting outside what I was feeling inside. Wet through, my cold, soggy dressing gown clinging to me and my slippers slippery on the pedals with the rain, I said goodbye to the nurse, himself wet through now, and left the hospice without knowing how I would ever sleep again. I went to my daughter and son in law's house, and lay down for my first night of widowhood, wet through, and cried. In the days spent sitting in silence with Alan before he died, I told him that he had been my greatest teacher. I spoke to him of the gifts he had given me, of how he had shown me how to live, how to be myself and how to speak my truth. I told him he was magnificent, and that I would miss him. Of course I told him I loved him, that is a given, but I wanted to tell him more, of the deeper and more powerful things that one person can give another. I told him I knew of his greatness, of his strength, of his wonder. Some of the times I couldn't speak, and I couldn't find the words, and so I stayed silent and hoped that he would know, somehow, in his silent unconscious world, he would understand with the greater powers that the dying may have, that I could not find the words to articulate his wonder to me. And now, after the funeral, after the celebration of his life that we held last week, I sit in his chair here in his home and I try to work out where this heavy sadness is located in my body. Ah, it is coming from my chest. My heart is heavy, and the heart holds love and loss. Today, I collected his ashes. I walked a mile to the next village through the autumn winds, through the swirling leaves as they flew about me, and collected a black carrier bag containing what is left of Alan. 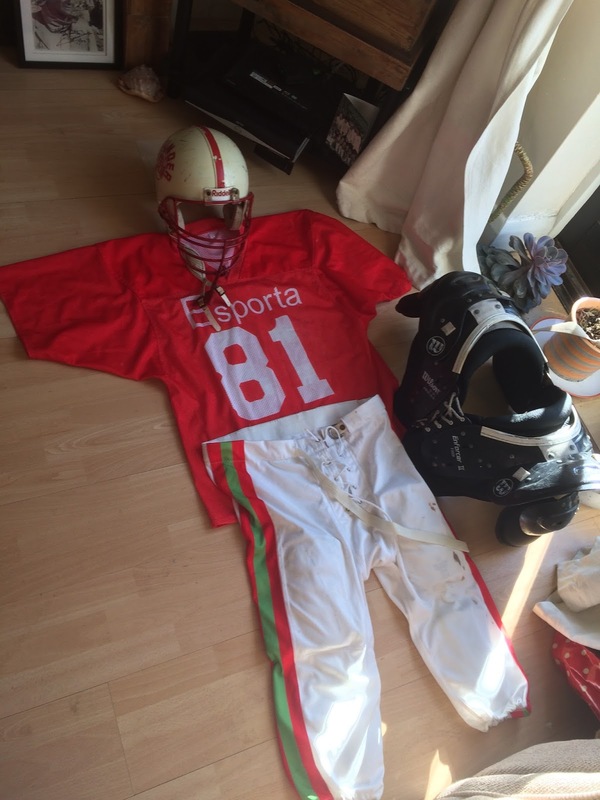 He went out in style, in his full American Football kit, and I wondered if the ashes of his special football trousers were mixed in with them. Walking home, I have put the ashes next to the television. He loved his television, and next to them is his American football and on top of them, is a framed, signed photograph of his hero, John Wayne. 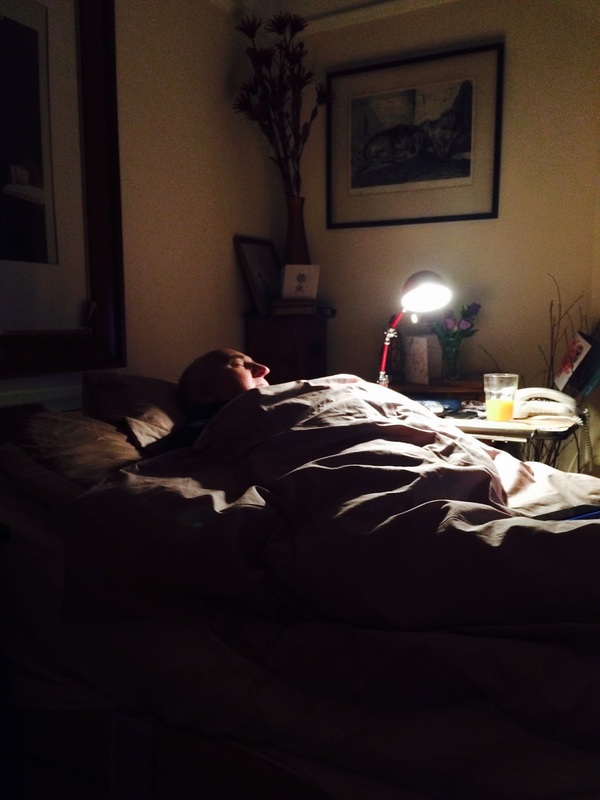 In the days before Alan died, there was a night in the hospice where I was overcome with grief. Leaving Alan sleeping, I went into the Sanctuary, a room set aside for prayer, meditation, thinking and peace. Sitting on a chair, I gave in to the tears I wouldn't cry in the room with Alan, and cried. I tried to pray, and couldn't. I tried to think of my brother Dominic who had recently died, and couldn't. I tried to stop crying, and couldn't. Into this bleakness came thoughts of my mother, also recently dead, and in my distress, I felt her put her arms around me, It was not quite that she put her arms around me, more that I felt her pass through me, I felt her presence and knew that she was with me. I felt that in my mind I saw her like the wind, a gentle wind blowing through me and bringing comfort that filled me with calm. My crying stopped, the storm passed, and deep peace entered the room. I am not alone, my mother is with me and now, I am calm. I went back to Alan knowing all was well, all was how it should be, and that I could do this. 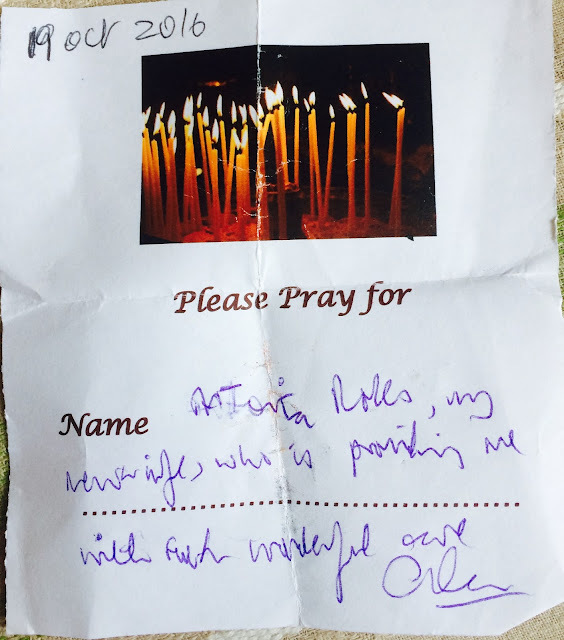 I found this prayer from Alan left in the Sanctuary and took it. I felt God would read it whether it was in my purse or in a pile of prayers in a hospice. It says Please pray for Antonia Rolls, my new wife, who is providing me with such wonderful care. Alan. There is a legacy when someone dies. The legacy is in the relationships of those left behind, to each other and in memory of the departed. The legacy of my remarkable Alan is visible in the love shown by his family, his friends and his colleagues to him and to all those around them. In the sadness of his death, the most overwhelming emotion shown by all around him, is love. The sadness is there, oh it is there. But the kindness of all those around him, in his world and in his family, is a great testimony to a great man. Alan was someone who focused on the path in front of him. He bent down to look at all the details beneath his feet, noticing each blade of grass, each pebble and how the path was constructed and where it was going. I am someone who lives high above the ground, I am comfortable in the space amongst the stars and the clouds, loving the space and the magnificence of the sky. Alan's gift to me was to take me by the hand and pull me back down to the ground. Look, he would say, look at all this detail. See how all this is significant, focus on all the things here on this path, this is deeply important. And my gift to Alan was to take him by the hand and lift him up into the sky and say Look at the space up here! It is safe, and magnificent, and there is magic and wonder up here. This is also deeply important. Thank you dear, dear Mr Bedford, from Mrs Bedford, with love. All is well. Summer last year, all is well.